When exactly did Amitabh Bachchan become ‘the Amitabh Bachchan’? The lanky elder son of poet Harivansh Rai Bachchan had made his presence felt in 1971 with Anand, holding his own as a quiet and serious doctor against the peppier, author-backed Rajesh Khanna. Many would count Prakash Mehra’s Zanjeer (1973) in which he starred as a brooding cop Vijay out to avenge his parents’ killer Teja (Ajit) — a Salim-Javed invention, the ‘angry young man’ had burst upon the scene like Diwali firecrackers — as a key film that made him a star. Until then, Bachchan was slaving away as a bit player, reportedly carrying a letter of recommendation from the all-powerful Indira Gandhi, a family friend, to get that elusive Bollywood break. In 1969, he had signed his first film, Saat Hindustani in which, like his father, he essayed a poet. Though largely inexperienced, the man with the famous baritone made an impact with his promising presence and crowd-pleaser lines like “This is my country” flung at clumsy and caricaturish Portuguese officers that would do well in today’s India. But it was the Mehmood-led madcap road trip Bombay to Goa (1972) that propelled this swaggering upstart, already pushing 30, to a leading man position. After a string of famous duds and post the fall of Rajesh Khanna, the undisputed marquee monarch of the 1970s, Amitabh Bachchan was finally in the reckoning. Whatever images the 1970s conjure up, whether it is the action-studded masala films, the Kishore Kumar ditties, the two-hero formula, the lost-and-found trope, the angry young man and his long-suffering mother, the boozer and brawler, the gun-toting vigilante, the betrayed son, the orphan raised by a priest, the criminal with 786 badge or the nervous professor, it is all in some way or the other linked with Bachchan. These images define Big B as much as they define the Indian movie-goers’ DNA. So, if the 1970s is Bachchan and Bachchan is the 1970s, as they say, is there a year or a particular moment in that decade that could be regarded as the Zanjeer superstar’s very best? Tough ask, but try looking back at ‘1975.’ That one single year gives a good glimpse of Bachchan’s reach and stardom, his talent for both drama and comedy and also points to how in later years, this man would effectively render everyone, from co-stars to even comedians, out of business. That’s because with his tremendous comic timing, was there even a need for a funny foil? If, for example, Amar Akbar Anthony was made during the 1950s, Dilip Kumar could have been a good choice for Amar. But here was a leading man who was chosen to play Anthony, a part which in a lesser film would have been allocated to a comedian. That’s the risk Bachchan took and some credit ought to be given to the visionary directors who made him their muse. Much in demand, Amitabh Bachchan was ubiquitous in the ’70s, working in multiple shifts with some of the day’s best directors, be it Hrishikesh Mukherjee or Manmohan Desai. If in those golden years, Bachchan had played every single role in a movie (except, the heroine’s) the public wouldn’t have even noticed. 1975 is central to the Bachchan filmography. We know that Rajesh Khanna’s unprecedented golden run was floundering while Bachchan’s stars were on the rise. By 1973-74, the supernova that had burned bright with dozens of blockbusters was burning out and eventually, faded. 1975 saw the release of Yash Chopra’s Deewaar. In keeping with the angst expressed in Zanjeer, Salim-Javed’s Deewaar was loosely based on the so-called good don Haji Mastan with knowing references to Mother India. As Javed Akhtar once explained, “In a society that lacked faith, it was natural that the gangster of Deewaar would take birth.” Was it fair for Vijay to take law into his own hand? And more crucially, were Salim-Javed justifying Vijay’s descent into the life of crime by presenting the warped argument of this man being wronged by society? Deewaar may have actually been prescient in terms of intuiting the youth rebellion and rising unemployment of the ’70s. Months after the film’s release, Indira Gandhi declared the infamous Emergency. The political turmoil that followed was probably indirectly complicit in the making of the angst-ridden Vijay. In a 2011 interview with Open magazine, Salim Khan, one half of Salim-Javed, called Deewaar their “greatest achievement.” No doubt, it was a huge success and over time, has emerged as one of Bachchan’s most legendary performances. The kitschy poster of Bachchan, in his dock uniform with a 786 badge strapped around his arm, the famous sidelocks growing out of his ear, has become an iconic image over the years. The film pairs Bachchan with Shashi Kapoor. As with several later films, they play screen brothers, just as Nirupa Roy would be immortalised as Big B’s mother. The plot can be described simply as a story of two brothers, on the opposite sides of the law with their mother as a moral figure hanging over their subconscious like a sword. In a film where Shashi Kapoor boasts the best catchphrase “Mere paas maa hai”, Bachchan gets to walk away with the emotionally-charged climax. Kapoor’s cop Ravi may have had the audience’s sympathy as the ideal son who would do no wrong, but Bachchan’s Vijay was the one the audience cared about and even rooted for. The same year saw Amitabh Bachchan in Sholay, as the brooding Jai. For many, including this writer, Sholay’s Jai remains a sub-genre unto himself. You stop following the film after Bachchan is killed in the encounter with Gabbar Singh and Co. Unlike Zanjeer or Deewaar, Sholay didn’t embody the zeitgeist of its times so much as it was a love letter to the masala-hungry Indian audiences. The film is also a personal landmark for Bachchan, as it was during Sholay’s casting, in 1973, that the superstar married Jaya Bhaduri. Here’s a fun fact: when the just-married couple returned from their honeymoon, a curious problem awaited director Ramesh Sippy, who had zeroed in on Jaya as the widow Radha. Jaya was pregnant. Contrasting the tough-guy Deewaar and Sholay roles was Hrishikesh Mukherjee’s comedy of errors, Chupke Chupke, another 1975 watershed. No one meeting this strapping fellow in the ’70s would have seen anything more than a tall-tree best suited to fist-swinging. But Hrishikesh Mukherjee, whom Bachchan lovingly calls his mentor, saw something that no one else did — the serious funnyman persona. Mukherjee adroitly exploited Bachchan’s lighthearted side in Chupke Chupke. The film rests on the exploits of its handsome leading man, Dharmendra, as a frothy, prank-loving professor, but Bachchan with his ‘corolla’ moment administers a dose of stomach-aching laughter. What else to expect from an English professor disguising as a botany expert? The Shakespeare-quoting professor bumbles his way through botany lessons, making a fool of himself but what the heck, he wins the girl. Once again, the co-star is wife Jaya Bachchan. Chupke Chupke established Bachchan as a comic star, proving his diverse range that’s on level with any great Indian actor. Amar Akbar Anthony, some years later, harnessed the same comic energy, albeit in a role that’s world apart from the upper-class Professor Sukumar. The fourth film from 1975, Ravi Chopra’s Zameer, yokes Bachchan back into the masala territory. 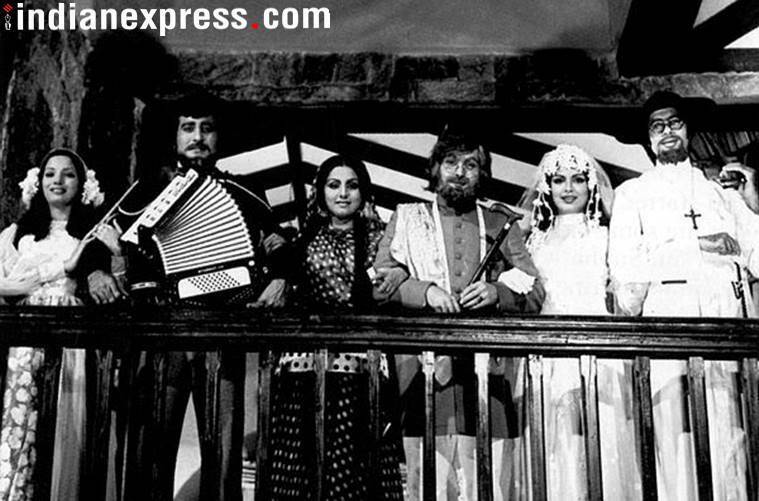 There’s also Shammi Kapoor and Vinod Khanna for company, the same team that made Parvarish, two years later, so delightfully memorable. It’s boilerplate Bachchan but who cares, the year 1975 belonged to the great superstar. Just as the rest of the 1970s did.